In Web Development, Many times we need to make Query string parameter as SEO Friendly, For this we need to make a changes in htacess file. Benefits of SEO Friendly URLs. 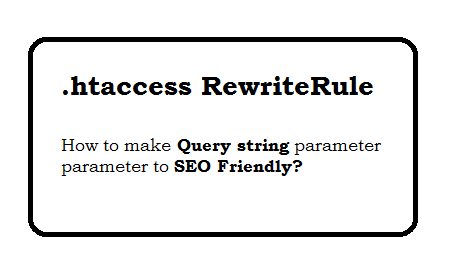 Following are useful mod_rewrite RewriteRule EXAMPLES which you can use in your website. 301 or 302 Redirection With PHP and benefits. Redirect internal links to another file with .htaccess. htaccess allow for IP address and should not ask for Authentication. How to redirect https to http in htaccess. non-www Redirect to www htaccess.